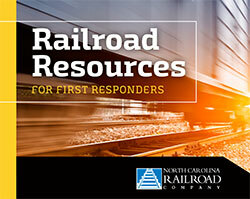 Attention First Responders, you can download a PDF of the Railroad Resources Safety Booklet below. Paper copies available upon request. In the U.S., approximately every 2 hours a train collides with a person or a vehicle. Trains cannot stop quickly enough to avoid a collision. It takes the average freight train traveling at 55 mph more than a mile—the length of 18 football fields—to stop. The average locomotive weighs about 400,000 pounds (200 tons) and can weigh up to 600,000 pounds. This makes the weight ratio of a car to a train proportional to that of a soda can to a car. You cannot accurately judge the distance and speed of an oncoming train. Never try to “beat” a train. A train can appear on any track at any time. Freight trains do not travel at fixed times, and schedules for passenger trains change. Always expect a train at each road and rail intersection. Only cross tracks at designated pedestrian or roadway crossings. Observe and obey all warning signs and signals. All train tracks are private property—trespassing is illegal and highly dangerous. Do not walk, run, cycle or operate all terrain vehicles (ATVs) on railroad tracks, bridges, or property or through tunnels. Never drive around lowered gates—it’s illegal and deadly. If you suspect a signal is malfunctioning, call your local law enforcement agency. If your vehicle stalls on a crossing get out and clear away from the crossing. Call your local law enforcement agency for assistance. Quieter technology makes it less likely that you might hear the approach of a train. Any approaching train is always closer and moving faster than you think. Stay alert around railroad tracks. Do not text, use headphones or have other distractions that would prevent you from hearing or seeing an approaching train. A train can extend 10 feet or more beyond the steel rail; always stay at least 100 feet from the rail. Always assume railroad tracks are in use, even if there are weeds or the track looks unused.